Kids today – once it was all about peddle power, now it seems perfectly acceptable to strap a motor to a tricycle to save their legs! 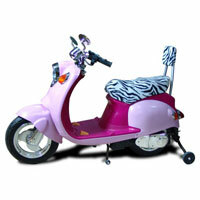 Still, if you’re going to buy your child a motorised bike, you might as well do it in style with this pink (sorry boys) Zoomer Scooter. Styled to look like a traditional scooter, it ends up looking not far away from Vespa’s current ET range than a prop from Quadrophenia. Still, I don’t think your kids will mind – it’s got 2 x 12v motors, which should give a maximum speed of around 3-6 kph. There’s a front and rear light and the scooter comes with rechargeable batteries and a charger. You’ll have to fix your own mirrors, mud flaps and fox tail (fake obviously) on. Available from Halfords for around £200.